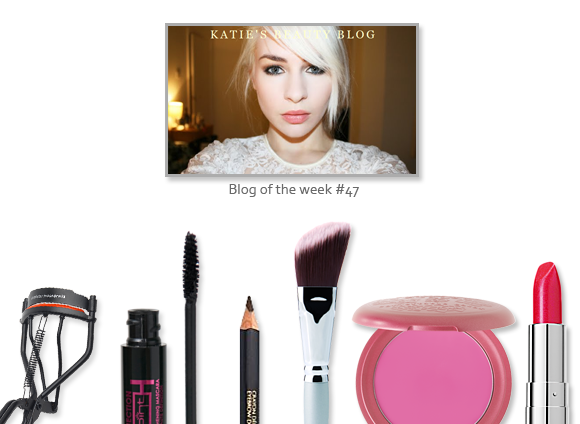 This week’s blog of the week goes out to Katie of Katie’s Beauty Blog. I originally discovered Katie’s blog as I was looking for some tips on how to care for coloured hair. I spotted her super long, bleached hair in a thumbnail on another blog, and I had to find out how she kept it looking so gorgeous! Since then, I’ve kept track of Katie’s blog. I love her mix of high end and high street beauty, and she always provides great coverage of the many press events that she’s invited along to. Her commitment to taking a tonne of pictures is admirable, and you can always count on lots of lovely swatches to whet your appetite. Another thing I love about Katie’s blog is the little conversational posts that she adds here and there, like her trip to Morocco, and the things that she got for her birthday. Having a little extra insight into the bloggers that you read so regularly is always a lovely thing! Take a peek at Katie’s gorgeous hair right here at Katie’s Beauty Blog. This entry was posted on Friday, November 25th, 2011 at 3:00 pm and is filed under Blog of the Week. You can follow any responses to this entry through the RSS 2.0 feed. You can skip to the end and leave a response. Pinging is currently not allowed.